It makes me very happy that after years of hating my body I'm finally able to share my weight loss journey and how I gained body confidence. I first felt "fat" when I was in my second year of high school. All of my best friends were slimmer than me and didn't look like they had any issues with their body and I unfortunately was cursed with being chubbier than the lot of them. I hadn't gained weight between the first and second year of school but I grew a bad opinion about my body from what was going on around me. I have bad memories that I can still remember now of a lad mocking my chicken legs after school and one of my closer friends mentioning that I had thunder thighs. I think a lot of confidence of your body gets majorly lost for teenagers depending on the people around them. 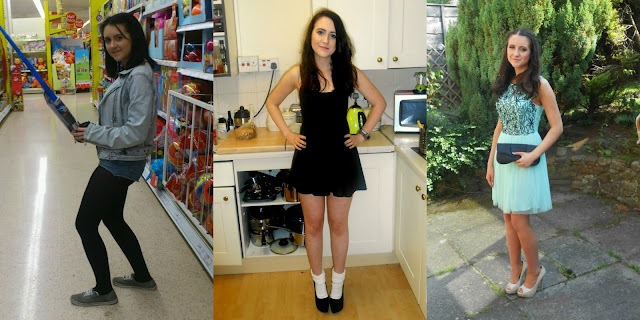 With people pointing out flaws I didn't even realise I had I soon began to hate my body. I wasn't actually overweight, my BMI was healthy for my age and height so I shouldn't really have been worrying but when you're young you listen to the people around you and are easily influenced into sharing the same opinion they do. I was only a size 10 and to me that felt huge when it wasn't unhealthy at all for a 14 year old girl. I didn't do anything about it though. I hated P.E, not just because it was exercise but because I despised anybody seeing me in shorts and having to show my bare legs off in front of everybody at school. I always wore tights or pants whenever I could, you'd only ever have the opportunity to see my legs if I was made to wear shorts during P.E. I look back now and do think I had eating issues, I'd get full packets of jaffa cakes and just sit their and demolish one their 24 packs quite regularly and every other night after school I'd find myself in McDonald's before going home to eat a full meal. It wasn't until I had a really short relationship when I was 15 and it ended badly and the guy told me I was fat that I decided I was sick to death of my weight. I went the complete wrong way about it but I did lose a lot of weight. I decided to cut down on my food intake but it got quite drastic. I'd stop myself getting hungry by constantly chewing gum and I'd keep myself out of the house a lot that Summer so my dad wouldn't question it too much. I was barely eating one meal a day and that meal I would have a few mouthfuls and then say I was full. This was stupid and the complete wrong way to go about losing weight but once I started it became a bit of an obsession to keep my weight down. It wasn't until my dad started to notice I wasn't eating properly and that I should probably go see a doctor about it that I realised I had some sort of problem. I became obsessed with the scales going from a 9 and a half stone to under 8 stone in a couple of months without 'doing anything' is actually a bit scary. Once I got below 8 stone I didn't want to go over so was always on the scales making sure I didn't ruin it for myself. I then got into a relationship for a few years and over that time ended up gradually building up my food intake to two proper sized meals per day and with that I gained more weight but never went over 8 and a half stone. It was only until I became single that I decided I didn't actually like the body I had again, however I wasn't going to do anything about it. After that relationship I had no confidence in my body so instead I just dressed in a way to cover up the lumps and bumps I had. I put on a few pounds over the months I was single because I was going out every weekend and drinking a lot and ending up at Dixy Chicken or McDonalds at least once a week. It was only until I met Ash that I wanted to get fit. It took months for me to get motivated to do anything. He said not to mention him much in this post because it's all about my journey but he was a huge help in it. 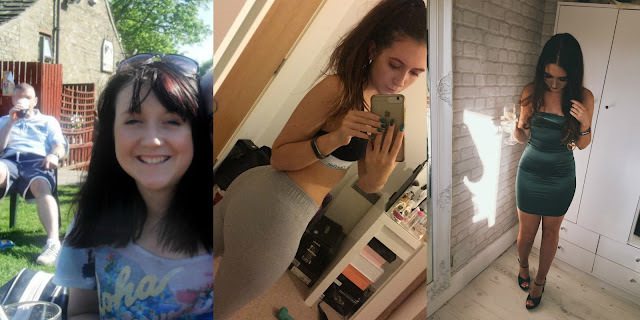 From the start he pointed out areas of my body that were really good and a focus point for me to gain the confidence to show off and he motivated me to start working out at home because he knew I really didn't want to join a gym. He started off by setting me days to train and which workouts to do and it was like having my own personal 24/7 PT to be honest. At this point he started training and that was enough for me to want to as well because I didn't want my boyfriend getting incredibly fit and me being the blob next to him. I started on The Bodycoach workouts. His Youtube channel is so good and updated regularly with workouts ranging from 8 mins - 30 mins and I rate pretty much all of them. The best one to start on I think would be the Low Impact Leg Burner. I also love the ones where he's in a nice location because it's a lot more motivating, like this one. After training for a while I then started to prep my lunch for work which consisted of a chicken breast, roasted sweet potato and broccoli. I was not a healthy eater before but doing this has helped a lot with my journey. At work I also drink a lot of tea but sometimes swapping my tea for a cup of hot water and grapefruit helped again with blitzing my belly. Since then I've stuck to training and try to do a workout once a day, sometimes even if it means getting up at 4am and doing a fasted workout before work to fit it in. I eat healthy still but allow myself treats as long as I commit to a brutal workout that day. I've started to use weights in my training so because of this I've added an extra meal to my diet and have a mid-morning meal of pasta (yes more food!!) because I need more apparently... I don't know all the facts and scientific side to it but it's working! I'm now again under 8 stone but this time I'm healthy and fitter. I'm gaining muscle and losing fat, and although people say I have no fat to lose, I DO. I'm just very good at hiding it and it's not a negative that I want to get rid of it. I've managed to gain a bum and my next aim is to gain some abs too. As well as The Body Coach I've also tried some of Mr PMA's and enjoy his too. Following Instagrammer's like Krissycela not only inspires me but she has some great routines that I've liked trying. I find Pinterest a good source for fitness tips and workout routines and love using this to mix it up a bit. My new-found body has allowed me to gain so much confidence with my body and I've started to love it. I wear clothes I never dreamed I'd be able to look good in. I get my legs out and I'm now proud too! I got myself in a bikini on my holiday and wasn't completely terrified (still a little bit though...) I must admit I take so many pictures of myself after I've trained, not only because I'm confident to do this now but because I love being able to track my progress. It's a very long journey and it's not complete yet because I still have changes I want to make, but I'm enjoying it and finally after seven years I feel happy with my body.